AMHERST, Mass. – When humans construct a building, it's intended to stand for many years, but in biological systems, cells routinely build structures and take them apart, re-using the pieces in different places and dissolving them again in an intricate process that scientists are just beginning to explore at a deep physical level, say cell biologist Patricia Wadsworth and biophysicist Jennifer Ross at the University of Massachusetts Amherst. Wadsworth adds, "If you build a sidewalk and all the students walk on the grass instead because it's not the fastest way, the sidewalk doesn't say, 'Let's reorganize and move over there to be more useful,' but biological systems do exactly that. The way biology solves problems is so unlike the way humans solve problems." In mitosis, one form of nuclear cell division, spindle fibers form a structure made of proteins that divides the genetic material, chromosomes, equally into two daughter cells. There is fresh recognition that cells' ability to build the structures that carry out this division, dissolving them, re-using and re-building them again millions of times per day, represents this very different kind of problem-solving and a new frontier not only for biology, but for physics and materials engineering, the researchers say. Ross and Wadsworth recently received a four-year, $1.1 million grant from the National Science Foundation to investigate the biological and physical underpinnings of cell division from this perspective. Ross explains, "This grant was awarded because we are offering two different ways of thinking, combining our understanding of biology by applying physics concepts to it." Wadsworth adds, "For about 100 years, scientists have been trying to understand mitosis. But despite many different approaches over many decades, the question of how the spindle forms, how it pushes and pulls on chromosomes hasn't been solved. Living cells are really great at turning over infrastructure and re-using it, and we want to learn how." Ross points out, "One thing you can't do with human-built structures is self-heal. But spindles can be cut in half, recover and go on working. The cell can recognize from its environment when it in a good position to divide, and if the infrastructure is right, it will go ahead. Imagine if we had roads that could detect a pothole and move materials to repair it on their own, we'd have self-healing potholes. This is something we cannot do right now even with modern materials." 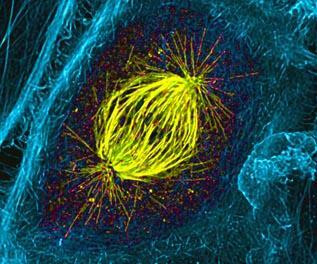 A key to their approach, the researchers stress, is that the self-organization of the mitotic spindle cannot be understood using biology alone. Rather, it requires understanding the underlying physical principles that govern the assembly and function of this molecular machine. Ross explains, "We're trying to marry a physical model of how these structures can form with the biology. We are at the very tip of this new understanding." She and Wadsworth will be testing the hypothesis that microtubules in a mitotic spindle act a bit like liquid crystal molecules. "They create a new state of matter that is a machine" Ross says. "From a physics point of view we don't know how this forms," but she has developed a system where microtubules align like pencils in a box, and when a cross-linking adhesion agent is added they spontaneously form spindle-like structures. Ross adds, "One mystery right now is how this structure remains so dynamic. It's not too rigid, it actually has both solid and liquid properties. We think that in the live cell, it tunes the extent to which it is liquid when it's aligning the chromosomes, then it suppresses the liquidity when it isn't needed anymore." Their new model creates a new physical framework to begin exploring the underlying fundamental principles that enable the spindle's dynamic self-organization. Wadsworth's laboratory will use equipment in the campus's Institute of Applied Life Sciences for this work, including quantitative light microscopy in the Nikon Center of Excellence, a specialized cell sorting facility and genetic manipulations to observe and test these ideas in candidate molecules in controlled experiments in live cells. An important goal, she says, is to quantify the distribution of components in the system. "Biologists like to compile lists of parts, but that alone isn't enough." she notes. "For example, you can have a complete list of the parts you need to make a car, but if you don't know how they are distributed and fit together, it's not very useful. The concept of the collective action of many different kinds of molecules is a key here."